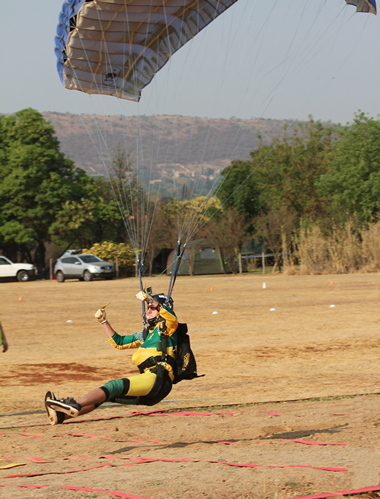 Canopy Piloting involves a series of tasks designed to test a parachutist's ability to control the canopy and fly accurately and is, from a spectator's point of view, truly one of the most exhilarating sporting codes to watch. 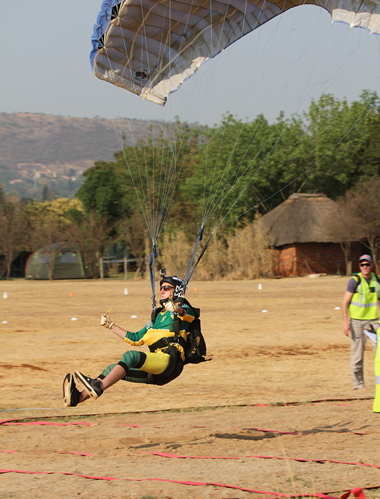 Again held at the Pretoria Skydiving Club, the oldest existing and permanent operating skydiving club in South Africa, the championships attracted the cream of the crop of canopy pilots. The club's world-class facility that includes a swooping pond makes it the ideal venue for the competition. 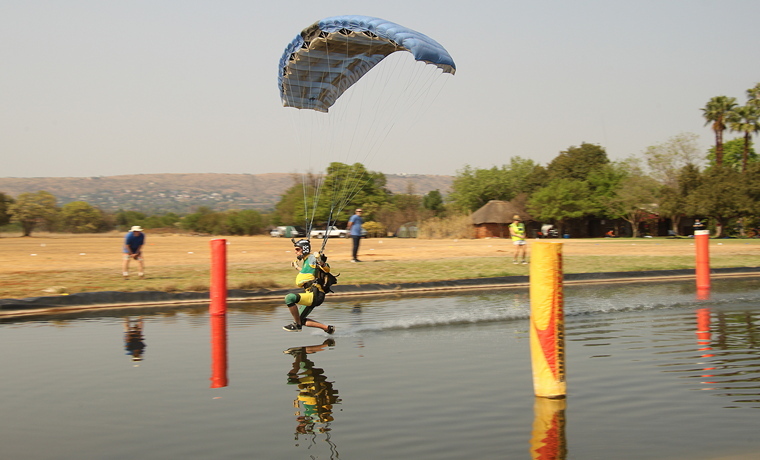 To prevent serious injury swooping whilst competing is done over a pond or a body of water. 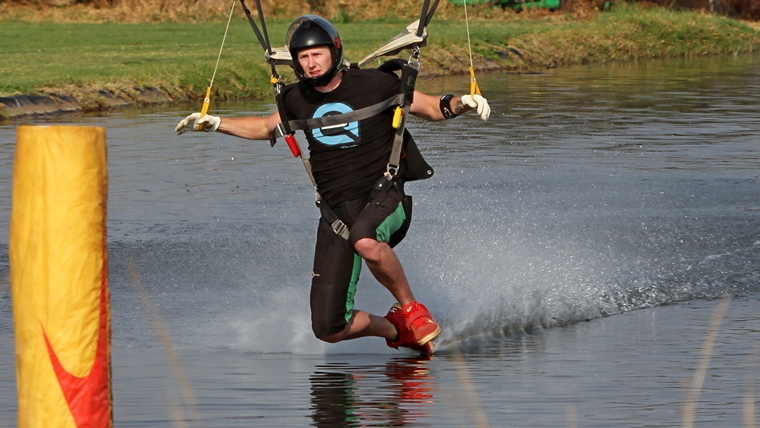 Swooping over water has the added benefit of offering excellent spectator appeal. Unfortunately because of the all the rules and regulations regarding public attendances at events and the huge amounts of money that needs to be spend on public liability insurance cover, events such as the Canopy Piloting Championships would no doubt draw more people to take up the sport, are not open to the general public. 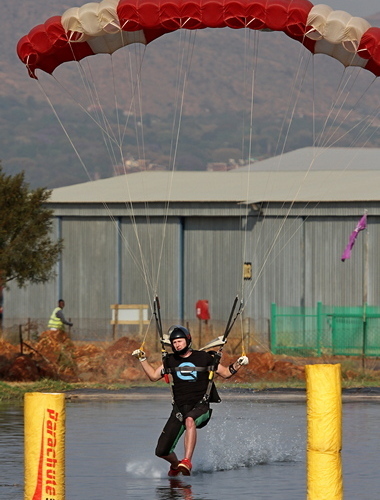 Each task starts with the parachutist navigating through a number of gates, which are situated on water. 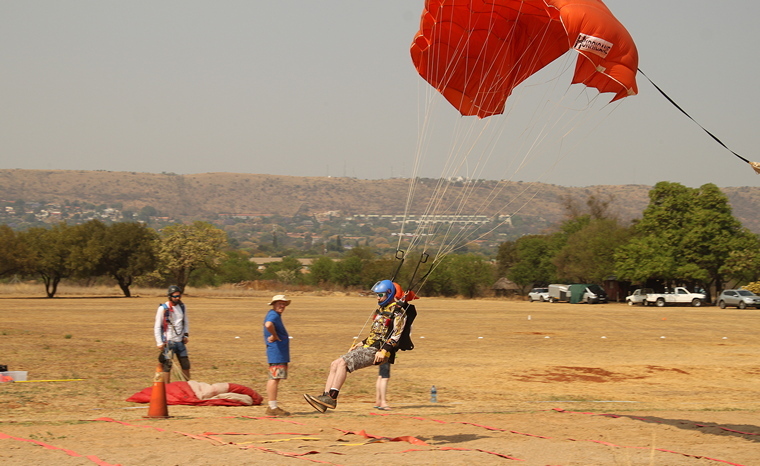 The parachutist has one of four goals, depending on the task; complete the course in the shortest time, therefore having the highest speed; complete the water section and then land on a target as accurately as possible; achieve the longest distance from the entry gate before touching down or perform freestyle manoeuvres while navigating the course in the most aesthetically appealing and precise manner. For speed the time is started by breaking an electronic beam across the course. The competitor's time is stopped as they break a second beam across the exit gate and their time is measured to the thousandth of a second. For accuracy the pilot passes between the course markers and stay within the course to gain points. 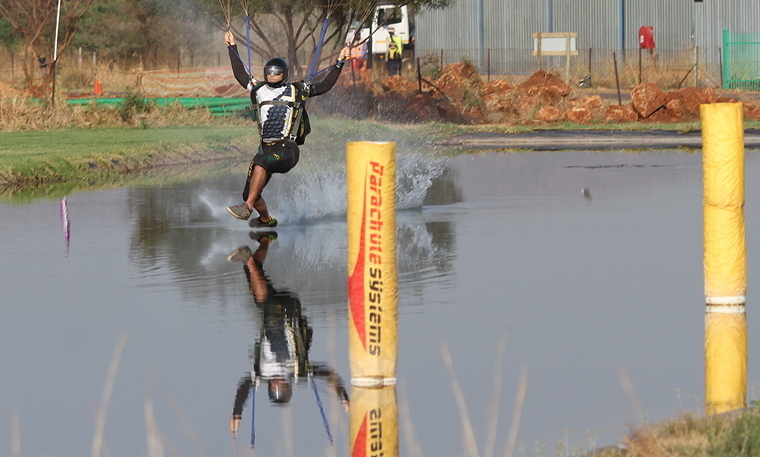 Extra 'gate' points are earned when a competitor drags a part of their body (usually their foot) through an imaginary line on the surface of the water between water gates. 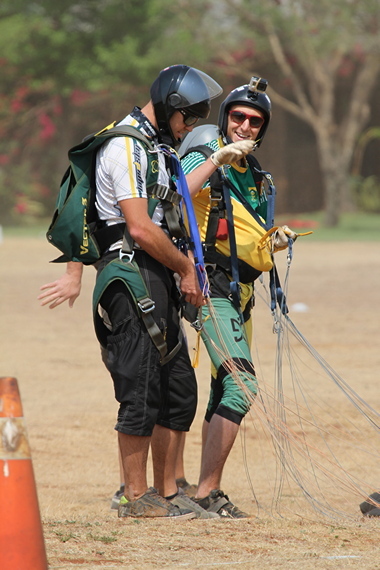 Penalties are awarded in the landing phase if the competitor fails to make a stand-up landing or is not in the central zone with their first touch. For distance the pilot passes between the course markers and remain within the boundaries of the course to obtain a score. Distance is measured from the entry gate to the first point of contact with the ground. 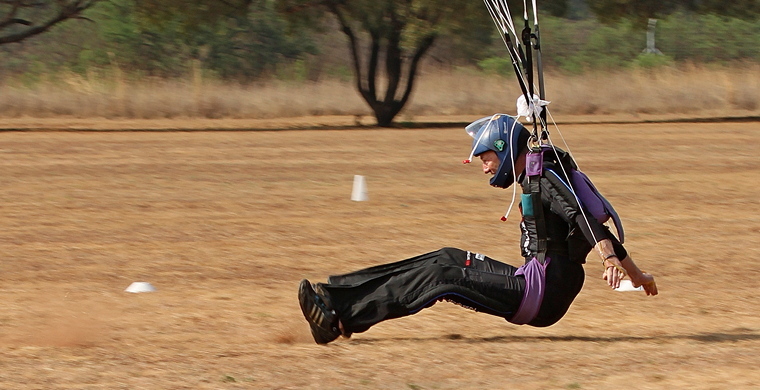 For freestyle the competitor navigates his or hers parachute through the course performing pre-determined moves. 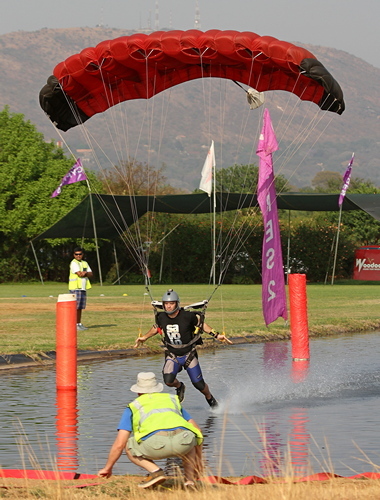 The competitor's objective is to navigate the parachute through the course while contacting the surface of the water in various ways, as specified in the different moves. The competitor gets scores for technical difficulty, presentation and landing. Graham Fields finished first with 441.551 points in the Intermediate Category followed by whilst De Wet Davel with 370.164. Quinton Henning with 303.00 points finished in 3rd place. Chris Teague with 800.00 comfortably took the Open Class with Matteo Pagani with 628.68 in 2nd place and Warren Hitchcock on 420.036 points in 3rd place. The wind at times unfortunately did not play ball, testing the skills of the competitors. 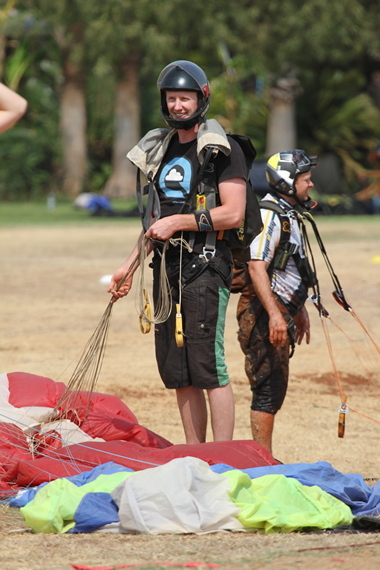 The competition however, despite a number of spills on landing, was incident free.